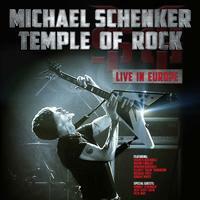 I really like this live Michael Schenker album a lot. It’s got what seems like it might be a full concert and then five tracks from another show as bonus cuts. Interestingly enough the main concert includes three (including Schenker) one-time members of the Scorpions in the lineup. They do some Scorpions songs along with some UFO songs, and, of course, plenty of Schenker tunes. Schenker shows that he has the skill to play melodic solos that generally create a song and complement it rather than overshadowing it. I’d highly recommend this set for sure. The one problem with this set is the vocals. I’m not sure if Doogie White was having trouble with his monitors or he’s just overworked, but he seemed to have trouble staying on key a lot of the time. The tunes without him are actually better. I hate to say that because he’s a great singer, but you have to call them like they are. Dramatic keyboards and symphonic elements serve as the background for the spoken vocals. That’s William Shatner’s voice, but it seems slowed a little, or otherwise processed a bit. That serves and the first part of the introduction here. Then, some serious metal guitar takes over, but the keyboards that come across the top change the focus. Schenker seriously shreds as this works through. In a lot of ways, particularly in the sections without those keyboards, this thing is sort neo-classically tinged power metal. This instrumental serves as a great backdrop for Schenker’s soloing and a great way to get the show going in style. This rocker starts with some guitar soloing before seriously rocking out as a straightforward tune. Here they tackle the classic Scorpions tune. Considering three former Scorpions were in this band (Schenker, Francis Buchholz and Herman Rarebell), it should be no surprise that they do a great version. This is a real screamer and I love it as performed here. Here we get another Scorpions song. While I like this one, it’s perhaps not as strong as the previous piece. Here we get more of a melodic rock tune. This is hard edged, but also far from metal. It’s got both a killer instrumental arrangement and some smoking vocals. In some ways this song is similar to the previous one, at least in terms of general motif. The thing is, the extended instrumental section that comes in later is a real screamer. I’d say it’s one of the best jams of the whole set. That really elevates this tune to one of the high points of the disc. This cut is a bit more metallic than some of the rest. Still, the melodic guitar soloing later is what really shines here. This one in particular is really a Schenker showcase. The thing is, I love how his solos really carry melodies and are more “song like” than some noodly guitar soloing. There is, though, a fairly short unaccompanied solo at the end that lands more in the “flash guitar” mode. We land back in Scorpions territory here. This crunchy, but still melodic, instrumental gets a great live reading here. Riff driven and mean, this is a killer melodic metal tune. It’s definitely got some great power metal going on here. The tune is one of my favorites on the set. It has an instrumental section that’s classically based and almost progressive rock in texture, too. This is a cool hard rocker. It’s got some great guitar soloing, but the vocals stand up to the guitar. When that guitar is played by Michael Schenker, that says a lot. This is the first of several UFO songs in the set. I’ve always loved this song and this version is great. It’s a real highlight of the set. Of course, there are so many highlights here that that’s kind of hard to establish. Starting with a keyboard solo, this is a competent hard rocker. It has some mellow, almost classical sections set into it for contrast. The guitar soloing is tasty and the vocals are strong. This just doesn’t seem to stand up to some of the other awesome material on show here. Overall, this is a more metallic tune. That said, though, there’s a melodic section mid-track that’s not really metal at all. This is competent, but somehow just doesn’t work that well for me. It should be noted that this is another of the UFO tracks. Although more of a straightforward rocker, this (another originally recorded with UFO) is more effective than the last couple tunes. It rocks out great. This has never been one of my favorite Scorpions tunes. That might have something to do with the fact that I used to play it in a band and we practiced it over and over again. In fact, the singer and I renamed it “Bore You Like a Hurricane” because we were so tired of it. So, it’s no surprise that while this rendition is good, it leaves me a bit bored. It should be noted that while White’s vocals have worked reasonably on the other Scorpions tunes, they don’t seem as effective here. There is a little crowd singing section in the middle of this one. Here we great another UFO tune. I’ve always loved this song and this is a killer live rendition. White is great here and the whole song just shines like crazy. The extended instrumental section on this is both powerful and soaring. This is another of those cuts that really stands tall beyond the rest. Schenker finds plenty of opportunity to solo, yet the song remains the king in this arrangement. Mostly sung by the audience here, I’ve always loved this balladic Scorpions tune. It’s a powerful piece of music and still holds up very well. This powerhouse metal tune from Scorpions days rocks out like crazy. Another UFO tune, this is a killer. It’s more riff based and just play kicks in style. They do a great rendition here. Here we get the first of five bonus tracks. The tunes are all repeats, these are recorded with some different musicians in place. They are live takes from the High Voltage Festival. This is a bit more raw, but also really strong. I think I might like this rendition better than the other one. The guitar solo is awesome. This time around it’s the High Voltage Festival rendition of this Scorpions tune. This one doesn’t seem to gel as well as the other version included on this album. Somehow, I think I like this better than the first version. In fact, despite my reservations about this song, I find this one rocks. This one’s just not all the special here. Finally we get the High Voltage version of this UFO classic. Somehow I don’t think this one is as good as the version on the main part of the disc. That said, it’s still pretty strong.